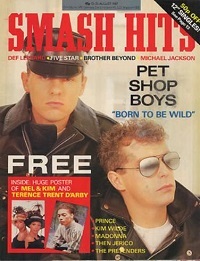 It's certainly not surprising that the Pet Shop Boys, as major pop stars, have appeared on literally scores of magazine covers around the world. In fact, their longevity probably ensures that, at least among contemporaries from their "imperial years" of the late 1980s, they've appeared on more covers than all but the top tier—artists like Madonna, Michael Jackson, Prince, U2, Bruce Springsteen, and George Michael. As much as I would love to display all of those covers here, that's simply impractical. So I'll settle for showcasing my ten favorite appearances of Chris and Neil on the covers of magazines throughout their career. Please keep in mind that this list is, of course, completely subjective on my part. They're listed more or less in order of just how much I like them. 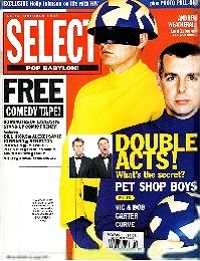 The January 2000 issue of the U.S. gay-culture magazine Out both featured the Pet Shop Boys on its cover and included them among their "Out 100," their annual list of those persons who, in the opinion of its editors, had made the greatest positive impact on gay culture and community during the preceding year. This cover is at the top of my favorites not only because of the specific recognition that it represents and its overall classiness but, even more, the outlandish non sequitur aspect of those bizarre—what do you call them?—net-things they're wearing on their faces. There's something strangely Hollywood about it. And I do mean strangely Hollywood. 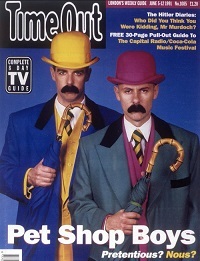 A June 1991 issue of the U.K. general culture/entertainment magazine Time Out – I've always loved this particular "PSB look," borrowed from their unforgettable Performance concerts of 1991 and originally inspired by the Belgian surrealist artist René Magritte. "Surrealist" just about says it all. But, more than that, I love the bowlers (aka derbies), I love the primary colors, and I particularly love the moustaches. I've always had a thing for moustaches, especially nice thick ones. 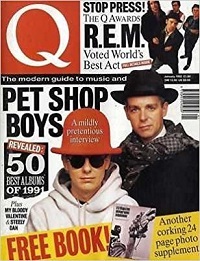 The April 1992 issue of the U.K. music magazine Q – Two years or so after its publication, a British friend sent me a copy of this back issue when he learned I had become a big-time fan of the band. Awfully kind of him. Neil's scarf is the essence of cool, while Chris's hat is so singularly uncool that it goes full-circle and comes out cool again on the other side. 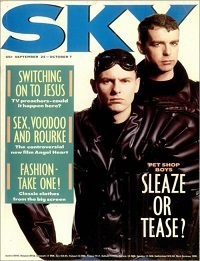 I really don't think Chris and Neil succeeded in convincingly pulling off the leather/biker drag they affected for this cover of Smash Hits from August 1987—a look they also employed around the same time for their debut rendition of "Always on My Mind" on the U.K. television Elvis Presley tribute Love Me Tender—but I give them points for trying. Then again, maybe they weren't out to "convince" anyone, in which case they deserve even more credit for what was, in effect, an elaborate visual joke working on multiple levels. 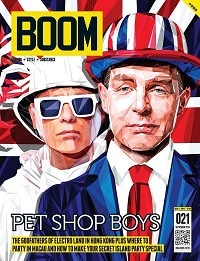 I truly appreciate that this September 2014 issue of the U.K. magazine Boom isn't just another photograph. Someone took the time to commission a bit of graphic art—based on a photo, to be sure, but decidedly different. The result is quite a striking image. A rather patriotic one as well, I might add. Gotta love Chris's inflatable Issey Miyake jacket from the cover of this September 1988 edition of the U.K entertainment magazine Sky. I also like the expressions on their faces: Chris stern, authoritarian, challenging, while Neil looks askance, perhaps consciously suppressing a slight grin. And the header "Sleaze or Tease?" is a keeper, too. 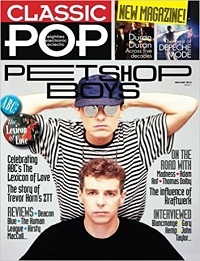 Classic Pop dug deep into the vaults—back roughly a quarter-century—for an early but iconic photo of the Boys to grace the cover of their very first issue in October 2012. The very fact that they, as opposed to anybody else, were chosen as the inaugural cover-artist says it all: classic pop, indeed. 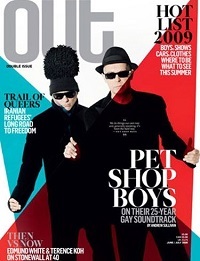 Chris and Neil made the cover of Out again in June 2009, celebrating their 25th anniversary as recording artists. And, like its predecessor, it's another of those almost inexplicable but oh-so-memorable art-for-art's-sake shots. As for Chris's headgear, surely that's the most extreme "bobble" ever found atop a knit cap. Wikipedia describes knit bobble caps as "traditional or old-fashioned British working-class football regalia," so maybe there's a point to it. Not that there needs to be. 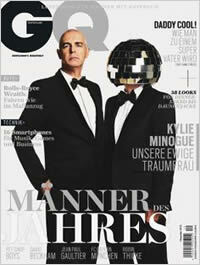 The Boys appeared in formal wear on the cover of the December 2013 German edition of GQ,* in which they were named among the magazine's "Men of the Year." Just as I've always had a thing for moustaches (see the second cover in this list), I've also always loved the look of men in tuxes. Yet Chris's insistence on wearing that delightfully preposterous mirrorball headpiece, which he sported onstage during their Electric Tour and in associated publicity photos—particularly in contrast to Neil's knowingly stiff, faux-hauty stance as he stares down his nose at the camera—adds just the right touch of self-deflating absurdity to the proceedings. *Gentlemen's Quarterly, of course, although in the gay English-speaking world it has for decades also been commonly, jokingly, and campily referred to as Gorgeous Queers and Gorgeous Queens.